Steam- and Waterproof flange F4 hole F2 hole flange bearing units with spherical inserts. 2 bolt pillow block and 2 bolt pillow block with thread are all IP66/67 waterproof and comes either as open or closed version. Made of Dupolit, which is of extremely stability and impact strength. NG-TEKNIK flange bearing are especially suitable for stainless steel production equipment in the food processing industry, where a high degree of hygiene is required. The flange housing is a unique product, which is easy to clean with rounded corners and smooth surface. 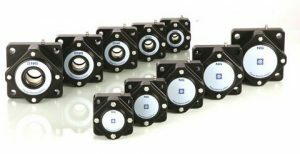 The flange housing is made with four mounting holes placed identical to other flange housing on the market.